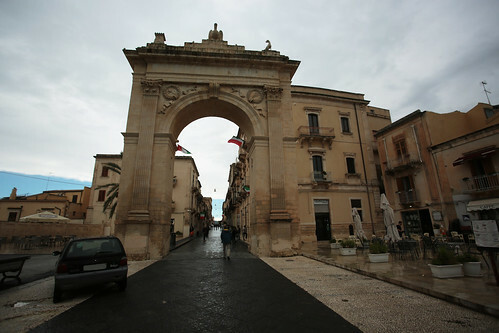 The stop in Noto was the last of my last trip to Sicily. Having the flight back to Rome at 15 from Catania airport, I had much of the morning to spend in the city, and so it was; today, therefore, I want to take you to find out what to do and see in Noto. The main monuments of the city are along Corso Vittorio Emanuele: just walk along the main street of the city centre to reach them all without difficulty. Both are located in Piazza XVI Maggio, overlooking Corso Vittorio Emanuele. 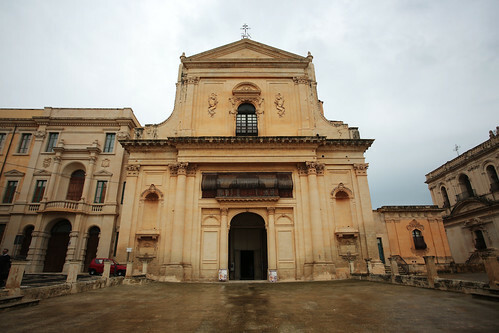 The church, among the most important and best-preserved testimonies of the Baroque of Noto, was built between 1703 and 1727 as a convent of the Dominican fathers, present in Noto already in ancient times. The façade has the central part with a convex shape, which makes it particular. The interior has been well preserved over the centuries. The former convent is now used as a school, has mostly been rebuilt. The fountain was built in 1756 by the Catania artist Orlando, it seems commissioned by a bourgeois family. The statue represented the rest of the hero after killing the lion Nemeo, of which not much remains because of an adaptation of 1838: Ercole was a symbol of the strength and genius of the city, for which the statue was “mutilated” of the arm left that held the club and was replaced by the city emblem. Of the lion, just because of this adaptation, remains just a tiny piece (only the right leg, to be precise). On the sides of the fountain are the monument of the poet Mariannina Coffa and the other of the jurist Matteo Raeli. 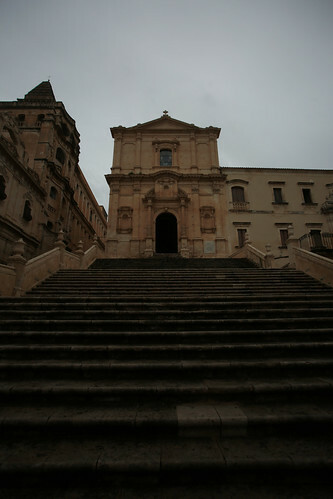 This is the (beautiful) cathedral of Noto, at the end of a magnificent staircase on the north side of Piazza Municipio. Begun in 1694 and completed in 1703, over the centuries it underwent numerous restorations both internally and externally: today’s appearance dates back to the 19th century when the new dome was built. Inside, structured on three naves, are still preserved several works of art (some of the ancient Noto era) and the silver urn containing the remains of St. Corrado Confalonieri. The iconographic apparatus was lost, unfortunately, due to a collapse occurred in 1996. In 2012, Pope Benedict XVI raised the cathedral to a minor basilica. 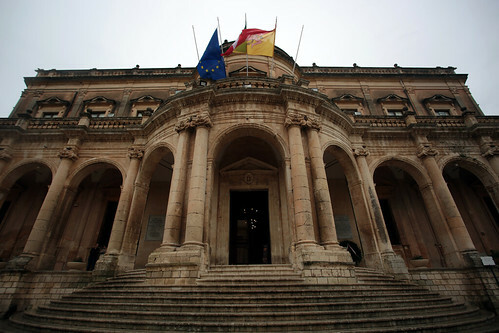 This is the building of the city hall, located precisely in front of the Basilica of San Nicolò: the palace is named after Ducezio, founder of the town of Noto. It was designed by Vincenzo Sinatra in 1746, taking inspiration from 17th-century French buildings, and was completed in 1830. The second floor dates back to the first half of the twentieth century (by the architect Francesco La Grassa). As for the interior, worthy of note is the Hall of Mirrors: it is an ovoid-shaped salon and furnished with Louis XV style furniture and large mirrors (sculpted by Sebastiano Dugo). The hall of mirrors houses painted on the vault, “The Foundation of Neas”: it is the neoclassical fresco, created by Antonio Mazza, which depicts the foundation of Noto by the Sicilian condottiero Ducezio. Adjacent to the former Benedictine monastery of the Santissimo Crocifisso, its official name is the church of Santa Maria Assunta. It was designed by Rosario Gagliardi around 1730 and was completed and annexed to the monastery in 1758 (today the monastery is a museum). The plan incorporates the model of the Roman elliptical churches built between the sixteenth and seventeenth centuries, and on the twelve internal columns, there are the statues of the apostles. Initially, the church had only one portal, overlooking Corso Vittorio Emanuele; the one on the side of Via Pier Capponi was added towards the end of the 18th century and today is the only access to the church. In 2006, the long restoration works were completed. This door, at the end of Corso Vittorio Emanuele, is (or rather, was) the entrance into the city. It was built in 1838, when the city was informed of the arrival of King Ferdinand II of Bourbon, on a project by Orazio Angelini. It was rebuilt after the earthquake of 1693. The same Angelini also built the statue of Ferdinand today a monument to the fallen. The square in front of the door was made/renovated in 2014, as part of the city’s restoration projects. 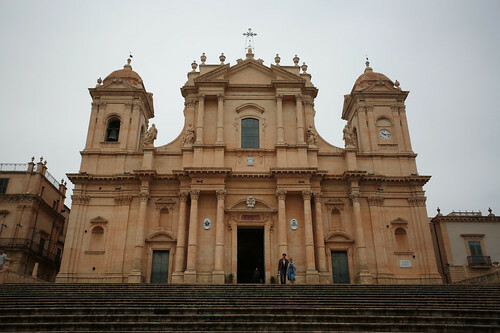 But what else can you see during a visit to Noto? 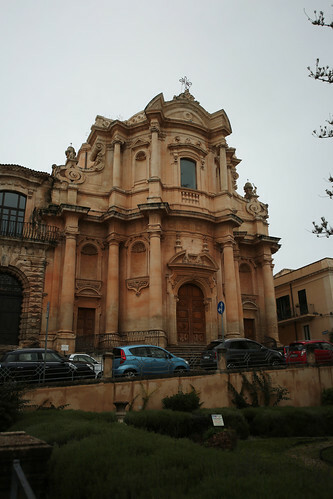 This church was built between 1704 and 1745, at the initiative of superior P. Filippo Tortora and on a project made by the architects Vincenzo Sinatra and Rosario Gagliardi. The former convent, attached to the church, today is mostly a university. The imposing staircase is “divided” into three ramps, one of which was added at the beginning of the 800 after the lowering of the road surface). Inside there are: on the left side the Arco dei Ss. Innocenti with the painting of the “Strage degli Innocenti” (1706, made by Antonino Vizzini) and the Arch of B. Andrea Conti with the canvas (1724) depicting the death of Fra Andrea M. Conti of Anagni. On the right side, instead, there is the Arch of the Franciscan Saints with a painting depicting Saint Conrado Confalonieri, patron of Noto, the sepulchral tomb of Fr. Giuseppe Bonasia (1756), the picture representing the Nativity (1783), and numerous others works worthy of note (in addition to other inspiring works, especially for connoisseurs and art lovers, religious art in particular). Perhaps slightly smaller than the other city churches, this is indeed worthy of note and visit during a walk in the city. Also, this museum, like the other main monuments of the city, is located in Corso Vittorio Emanuele (at number 149). The museum is divided into two sections: the first is the archaeological part, where the findings from the excavations of the ancient site of Noto and the old Greek town of Eloro (today prey of archaeological looting) are collected; the second section is the artistic part, given that it is the E.E. contemporary art gallery. Pirrone: this museum in the museum was born thanks to the donation of the works of the sculptor Giuseppe Pirrone. There are sculptures, reliefs and medals produced in various materials (earthenware, gold and others). I am Camilla, class 1987, born and raised in Rome, where I also studied from elementary to university. From my parents I made the unrestained passion for travel: I like to travel around the world, visiting new places, fall in love every time something of that country and then leave each time a piece of heart. I've been shooting Europe long and wide, knowing every little corner and every story in London (cities that I love and visit at least once a year) and by accident, in April of 2011, I opened my Travel blog.